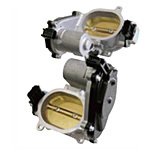 A throttle body having two butterfly valves. 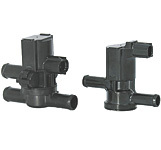 With a phase difference, the link mechanism opens and closes the downstream valve via the upstream valve. 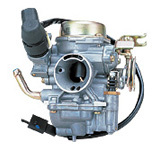 VM type carburetors provide direct response from the engine and are excellent in cost performance. 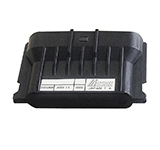 A multi-function sensor module that combines three sensors (non-contact throttle position, intake air temperature, and pressure) into a single package. 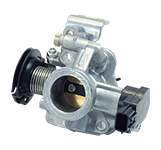 While throttle valve operation is electronically controlled, intake port is made straight by making it an oval shape. A throttle body having a main throttle valve directly connected with throttle grip and a sub-throttle valve controlled by ECU. 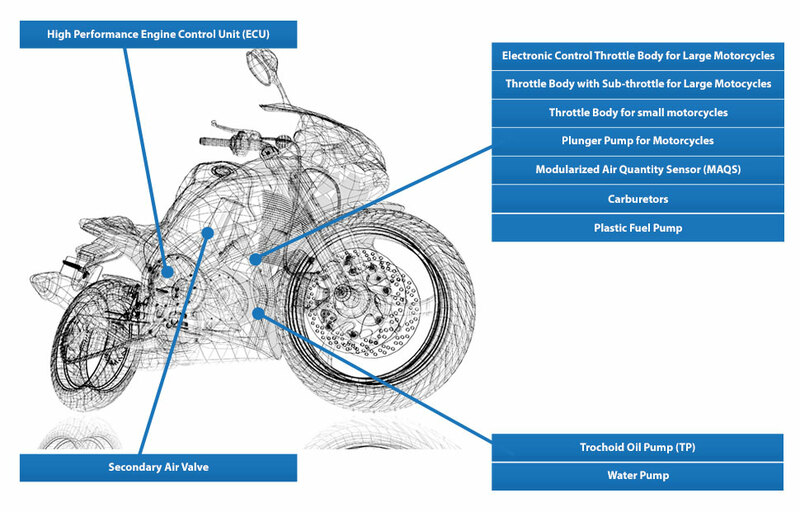 Performs overall control of engine intake and exhaust systems, fuel supply system, ignition system, etc. An in-line fuel pump with the plunger pump and injector unified on the intake manifold. 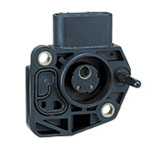 This diaphragm fuel pump comes in pulse type and piston type. Light weight and low cost achieved by use of plastic bodies. Self-priming type is also available. 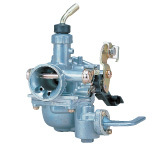 Valve which controls secondary air supply to the exhaust port to re-burn incomplete combustion for emission control. 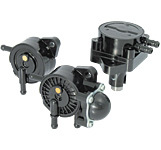 Circulates oil for lubricating four cycle engines. 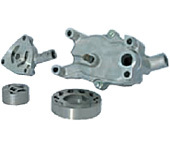 Low cost attained through in-house production of its trochoid rotor. 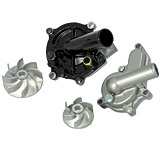 Impeller type circulation pump used for water cooled engines. 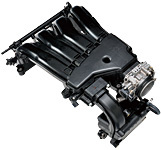 In addition to optimizing layout of entire air intake system, weight saving and low cost were achieved by resinification of intake manifold and fuel rail.